Yesterday, we showed you Ted Cruz holding his shotgun backwards, blatantly flouting the first two rules of gun safety. Now, we have a new video from the same photo op perfectly demonstrating why this is a bad idea. Would you want to be one of the hunters he’s pointing his gun at? Never point a firearm at something you’re not willing to destroy. And this is a perfect demonstration of why those rules are so important. 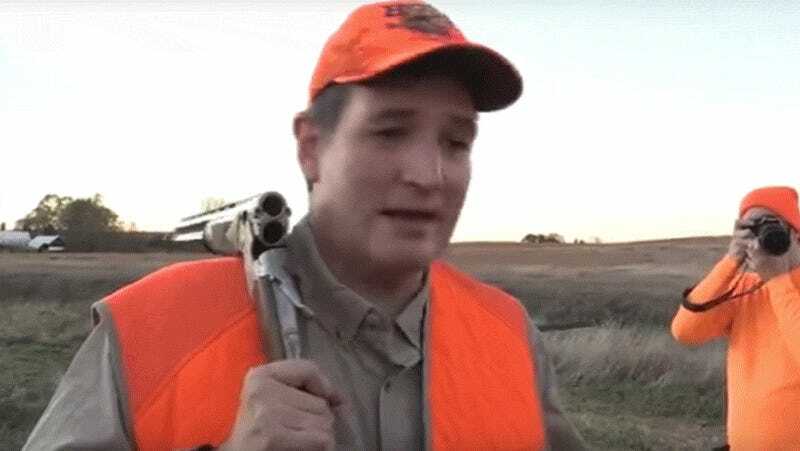 Seemingly unaware, Cruz is pointing the muzzle of his shotgun directly at his hunting buddies. Ask yourself, if you were standing back there, would you want that gun pointed at you? Would you know it was broken open and unloaded? Accidental shootings kill hundreds of Americans every year. Accidents happen. But, observing proper gun handling form, always, every single time, can prevent them. Doing just that is drilled into all new shooters as they learn and is something any experienced shooter or any gun rights advocate should not only observe, but espouse. No, a broken-open shotgun like this one, demonstrably unloaded, does not present a hazard. It’s simply careless gun handling. Practicing safe form, always, habituates behavior and guards against mistakes. There’s no gun range in America that wouldn’t caution you for pointing a gun — even an unloaded one — at other people. And there’s no hunter who wouldn’t immediately tell anyone pointing a gun at them to knock it off. As a public figure campaigning on a pro-gun platform, Cruz should first and foremost consider himself a role model for gun safety. The responsible use of guns is central to any pro-gun argument. And that’s why shooters and hunters like you and me should hold Cruz to a higher standard. The simple fact of the matter here is that Cruz is not only setting a bad example, but he’s also demonstrating a lower alacrity for gun handling than you’d expect from someone claiming to be a gun enthusiast.